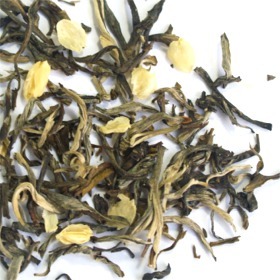 Snow Flakes Green Tea is a jasmine-scented tea produced from high quality Green tea leaves. Snow Flakes Green Tea makes a light, delicate and long lasting floral aroma tea. Snow Flakes Green Tea also has jasmine petals in them. With the benefits of green tea and jasmine tea, Snow Flakes Green Tea is a great buy for double health benefits. Sweet aftertaste and lovely jasmine fragrance. Slightly twisted young tea bud and leaves with jasmine petals.